today is Wednesday December 29 2010 and it is day 5 for my field sampling. before i went to the sampling, i went to the IBEC office to return back the new Garmin GPS that i just borrowed yesterday. its sound a bit woozy but that's how it goes around here. students objectives were not the main priority. if you do a research project under master of PhD program, only then you could borrow anything you like whenever you want it. lucky for me that the akak (I'm not quite sure what's her name and i guess its better for me to not just guessing it) told me that alang-alang you have borrowed it, better go for 1 week. all i have to do was just fill out a new form to extend the borrowing time. hehs. I'm feeling a bit ecstatic over then bro. so i returned back to Kolej Kenanga with the GPS in hand and get myself prepared to get dirty in just a few minutes more. i entered the forest at 1545 and got out at 1715.
today's objective is to enhance the pitfall traps that i placed earlier with some new technical aspect. the problem with my previous set up was the possibilities of getting specimens were not quite good enough. Pui (master student of Dr. Indraneil Das) helped me with the additional enhancement. the trap need to be built with some sort of highway that would guide the animal into the bucket. this guided fence does not need to be solid as a rock but as long as it could withstand some force, then it is okay. a roll of plastic bag were brought along by me since Pui asked me to do so. placing 1 bucket in the ground was already hard enough and arranging it back would make me want to slit somebody throat over there. the forest floor was swampy as usual for rains keep on pouring its heavy balls sack everyday. wow. tapi yelah. nak buat macam mane. hujan itu adalah rahmat dari Allah S.W.T. aka rain is a blessing from Allah S.W.T. today's work only goes about 50%. need to add up another 50% more for tomorrow. hearing the thunder roars, we decided to get out quickly as rain would interfere in our jobs. as we got out, i went to the bus depot to fairly clean myself from the dirt. as i was doing my thing, i saw Pui's car got stuck in a mud. he was trying hard doing anything he could to get himself out. i turn back my motorcycle and headed towards him to give a hand. with the power of my fat on my body, i pushed the car and it moved! hahahhaha. nice eh? so he thanked me and i thanked him and we both went our separate ways. back at Kenanga after i cleaned myself up, its time to watch some Football lads! as soon as i arrived at Warung 2000, the TV starts showing Negaraku anthem being sang. damn its nice. ordered a chicken chop and straight to the point. Malaysia won! woohooooo! 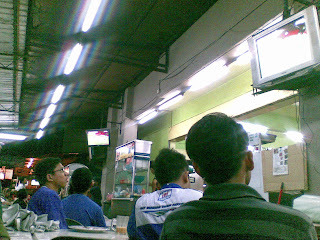 its Indonesia 2 - Malaysia 1. final aggregate was Malaysia 4 - Indonesia 2. nice game played by Malaysia's own Harimau Muda. yes sir!